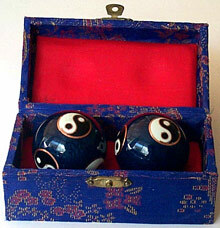 Chinese iron balls have long been famed as one of the "three treasures" of Baoding, China. First produced during the Ming Dynasty(1368-1644), iron balls have often been improved through the ges by skilled Chinese Handicraftsmen. Directions: The balls are placed in one's hand and rotated in either a clockwise or counterclockwise directin, This exercise will keep all of the points in one's hands in constant motion, with the muscles in one's fingers and forearms contracting and relaxing harmoniously.